I think everyone can agree with Homer Simpson that donuts are great. They’re a breakfast, they’re a dessert, and even just a snack. They’re one of the great “on the go” foods because they’re so easily portable. Unfortunately if you eat too many donuts you’ll end up sharing a waistline with Homer Simpson and not just a food appreciation. I suppose this has been my roundabout way of saying that I’m reviewing donuts this week. I first saw Entenmann’s French Toast Donuts in the grocery store last week, and since they happened to be on sale I decided I couldn’t pass them up. They sounded too yummy not to try, and obviously I always like things better when they’re on sale. Besides, I’m all for interesting breakfast food mash-ups (we did come up with francakes after all). I could already faintly smell the hints of French toast when I picked up the box, so I was excited to give them a taste. So, how’d they do? 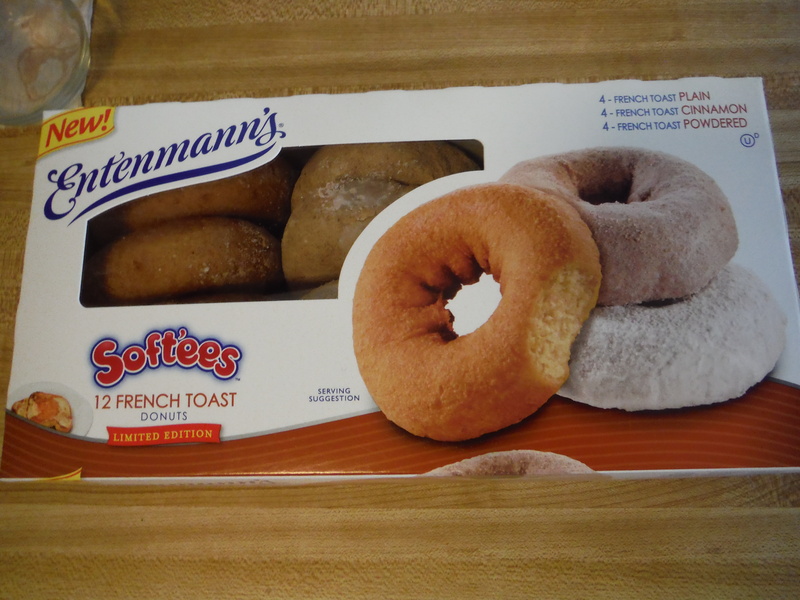 The base of these donuts seems to be the same as the regular Entenmann’s Softee donuts. So if you’ve had those you have at least a vague idea of what you’ll be getting when you buy the French toast ones. 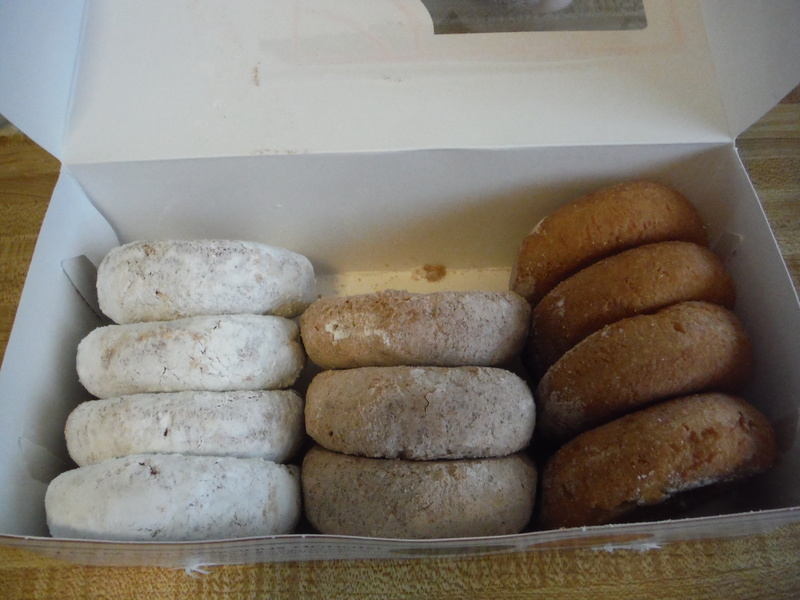 There are three different varieties of French toast donuts in the box; plain, powdered, and cinnamon (same as with the regular Softees). You do get 4 of each flavor. Someone just got to the box before I could take a picture. I started with the plain since I figured that would give the best taste of the difference between their regular Softee donuts and the French toast ones. They smell very maple-y and like French toast upon first inspection. Unfortunately the flavor is a bit more subtle than the smell. There’s definitely a different type of sweetness to them, but it’s not an overwhelming difference. Yummy, but it would have been nice if the taste matched the smell in intensity a bit better. I thought that the cinnamon one would be my favorite, since that’s my favorite of the regular donuts, and something French toast flavored could only benefit from more cinnamon right? Actually it turned out to be my least favorite. Unfortunately instead of adding to the French toastiness of it, it just masked most of the flavor. 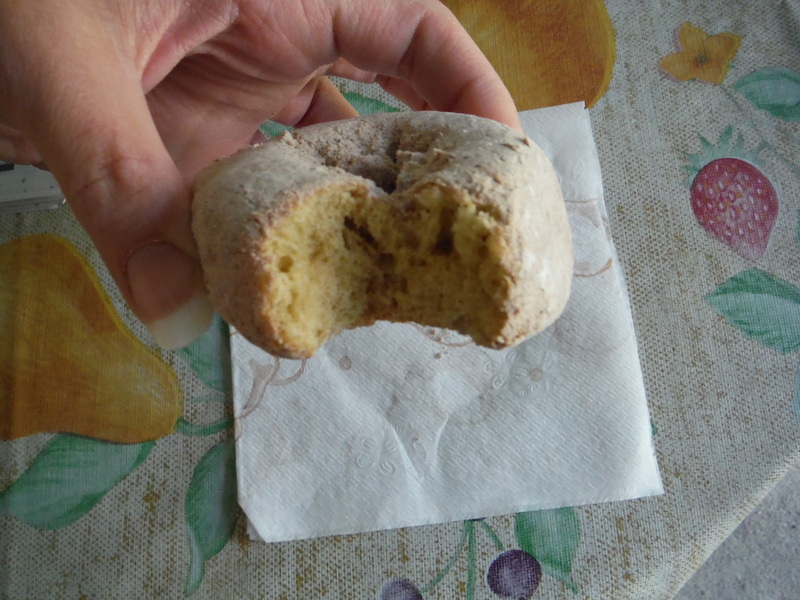 It tasted the most like just a regular cinnamon Softee donut. Which doesn’t mean it’s bad; like I said, that flavor is my favorite of the regular ones. But for something that’s supposed to have a different flavor it was disappointing. Surprisingly, the powered donut turned out to be my favorite. It tasted the most like eating French toast with powdered sugar on top. Somehow the powdered sugar made it taste more French toast like than just the plain one did. I would buy a whole box of just the powdered sugar variety. One plus of these donuts is that, while not good for you per se, they’re also not really bad for you. Even the ones with extra sugar are about 100 calories less than a plain Dunkin’ Donuts donut. So you can feel at least a little freer to indulge in these donuts than you might others. Overall these are good donuts. Texture is good. Flavor is yummy. The French toast flavor isn’t overwhelming, but they do have a nice taste to them. I would definitely recommend them to anyone who is interested in trying them. Just make sure to remember that the taste isn’t as strong as the smell and I don’t think you’ll be disappointed. Posted on May 12, 2015, in The Snack Report and tagged breakfast, cinnamon, crazy crossovers, dessert, donuts, review, yummy. Bookmark the permalink. 3 Comments. I wouldn’t call them healthy just because they’re 100 calories. They’re most likely full of sugar and other junk chemicals which makes the calories lower, but not any more healthy. We do advocate homemade stuff obviously, especially because of the ability of controlling the ingredients that go in, but the sad truth is that some things aren’t realistic to make at home unfortunately. And unless you’ve got cash to burn, it can be depressingly tricky to be a total ingredient watchdog, since a trip to Wild By Nature or Whole Foods can be a traumatic experience for those of us who are less-than-well-off. And furthermore that if you want your diet to be God-Tier healthy, you will need to say farewell to most desserts. Say what you may, but my personal belief is that sugar isn’t as evil as people have made it out to be over the past 10 years. Sugar and carbs are surprisingly easy to burn off through exercise, and aren’t the magic, physics-defying evil that WellnessMama and other sites have built them up into. So rather than deprive yourself of sugar (which is in fact necessary for your endocrine system to function), a more down to Earth solution is instead to be more active to burn off those empty calories you gain through dessert.